R.I.P. Geoffrey Hayes - 13 March 1942 – 1 October 2018. 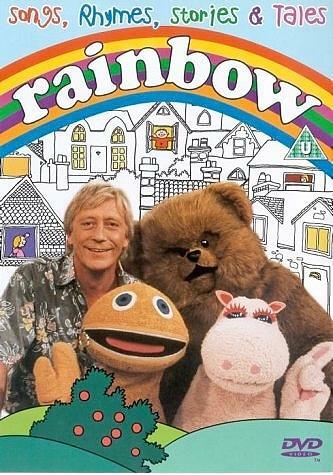 Following the sad death of presenter Geoffrey Hayes on 1st October 2018, aged 76, I thought it was high time that I added a page dedicated to the cult kids TV show Rainbow. So here it is, finally! The programme ran for 27 series (1071 episodes) from October 1972 until March 1997, and was originally shown five times a week at lunchtime, before eventually being aired twice weekly and then once a week on a friday during its final years. The educational TV series was created by Pamela Lonsdale for Thames Television and was often compared to the American series Sesame Street. The show's original presenter was David Cook (he died on Sept 16th 2015, aged 74), but Hayes took over the role from 1973 onwards. As well as contributing to the writing of the show, it was Hayes idea to make Zippy a tangerine colour to represent his favourite football team Dundee United - he lived in the city during the 1960s.Hayes had previously worked as an actor, and played PC Dave Scatliff in Z Cars during the early 1970s. After Rainbow's demise, the presenter struggled to find any acting roles, and found himself stacking shelves at Sainbury's for several months. He eventually found work as a taxi driver before eventually retiring. Hayes had previously worked as an actor, and played PC Dave Scatliff in Z Cars during the early 1970s. After Rainbow's demise, the presenter struggled to find any acting roles, and found himself stacking shelves at Sainbury's for several months. He eventually found work as a taxi driver before eventually retiring. One of his most recent TV appearances was on Pointless Celebrities which aired on BBC1 during September 2015. So, what about the show's other main characters? Who could forget Zippy? Now this was a character that I found pretty irritating (and I'm sure I'm not alone) although he did provide good humour, too. His overbearing, destructive manner, self-centeredness and loud throaty voice really grated on me, and this should come as no surprise, considering that voice was provided by two men who also voiced the Daleks and Cybermen in Doctor Who, Peter Hawkin and, later, Roy Skelton. Zippy was operated by Ronnie Le Drew. Thankfully, as his name would suggest, his mouth was actually a zip, and the most joyous moment of the programme (for me, at least!) was when Geoffrey zipped his mouth shut! George the hippo was my favourite character, being introverted and sensitive (like myself), although his loveable character bordered on being camp, and his pink colour didn't help matters. Add to this his dumb-sounding laugh, and no young lad was ever going to admit to his friends that he actually liked George, for fear of being ridiculed or bullied in the school playground! Surprisingly, his gentle voice was also provided by Roy Skelton. Bungle the Bear was loveable, too, of course. He was curious, clumsy and also critical of the other characters. He never wore any clothes, so it was always baffling as to why he would decide to put pyjamas on at bedtime! 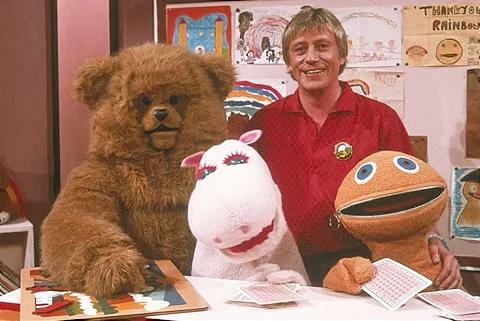 Rod, Jane and Freddy actually started out as Rod, Jane and Matt from their debut in 1974 until 1977, with Matt being Matthew Corbett, who hosted The Sooty Show from 1976 until 1992. He was replaced by Roger Walker until 1981, when Freddy Marks took over and they became the more well-known trio of musicians. From 1972 to 1974, Charlie Dore, Karl Johnson and Julian Littman were the three musicians. Rod, Jane and Freddy left Rainbow in 1989 to focus on touring and pantomime, as well as their own TV show which first started in 1981. Guest singers and Dawn Bowden (who replaced Jane) were used instead. 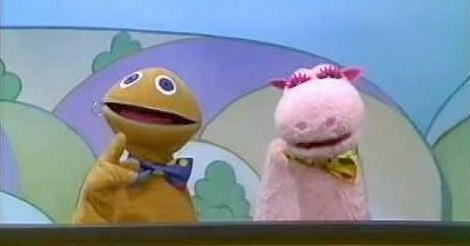 In the first series in 1972, the characters Sunshine and Moony were the main puppet stars, with Zippy, George and Bungle having less prominent roles. Zippy's cousin, Zippo (nothing to do with the cigarette lighters, although he could have been a pyromaniac in his spare time) originally appeared as a French character, although later made an appearance as a rapper, possibly in a desperate attempt to stop the show's decline in ratings. George's cousin Georgina looked exactly like him, but had longer eyelashes and wore a floppy hat. Geoffrey's Aunty was played by a number of different actresses. Dawn, the next door neighbour, appeared from 1990 onwards. Rainbow has developed a cult status since its demise, and several dance versions of the theme tune have been released as singles. Solo released an instrumental version in 1991, and Eurobop released a version in 1993 which used samples of the theme music and characters in the show. Another version entitled "It's a Rainbow" reached the UK Top 20 in 2002, and you can watch the video above.